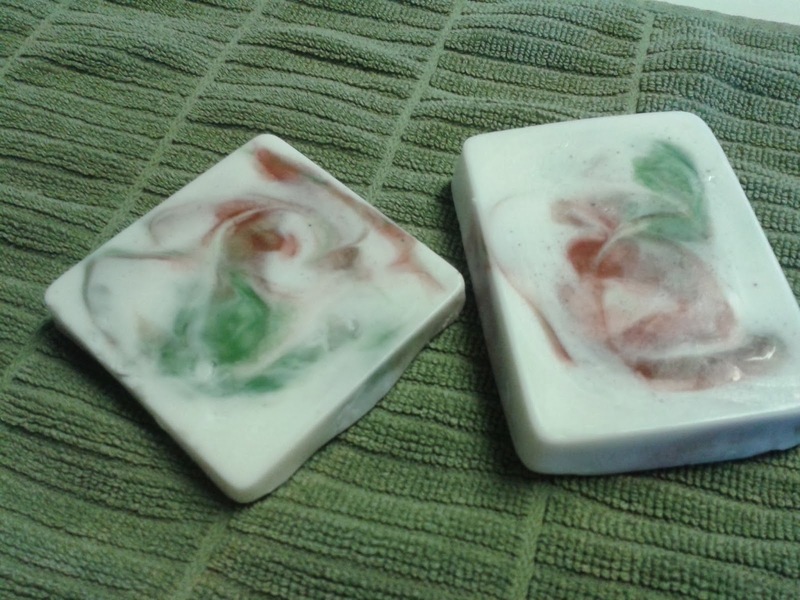 These soap bars are so over-the-top Christmas and they are super easy to make. We're using melt and pour base, so they'll be done in an afternoon and can be used right away. These are definitely on my go-to list for last minute gifts. I always keep several bars, packaged in tiny craft bags with a big, fun label. I'll leave the TO section blank. When a quick present is needed for a last minute get-together, or when unexpected guests arrive bearing gifts, I can go to my cupboard and take out the bag, fill in the name and it's ready to be given. favorite things on the entire planet! 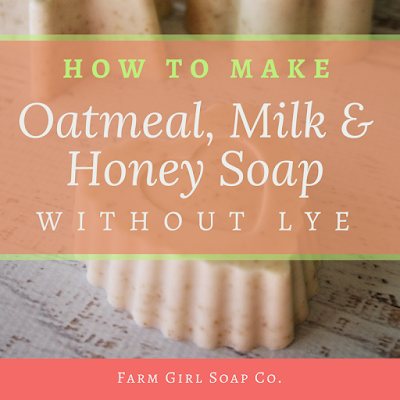 If you've never made melt and pour soap before, make sure you take a look at the quick tutorial that I've posted. 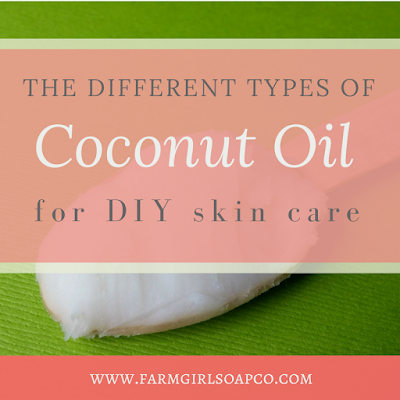 Then, gather your ingredients and get ready to start soaping! You can do it... I promise it's super easy. I do recommend reading through the directions at least once before starting your project, though. Step 1: Measure out your white soap base and put it into a small pot. If you don't have a kitchen scale, you can get a fairly accurate estimate by cutting 6 - 1" cubes from your soap block. Step 2: Measure out your clear soap base and put it into a second pot. Step 3: Gently melt both bases over low heat. 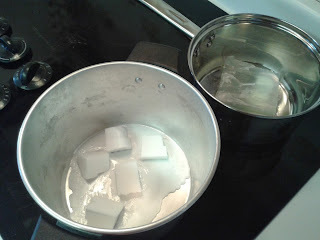 Don't let your soap simmer or boil, otherwise it will scorch. Melt the soap slowly. It can take a few minutes. Step 4: While the soap is melting, prepare your colorants. 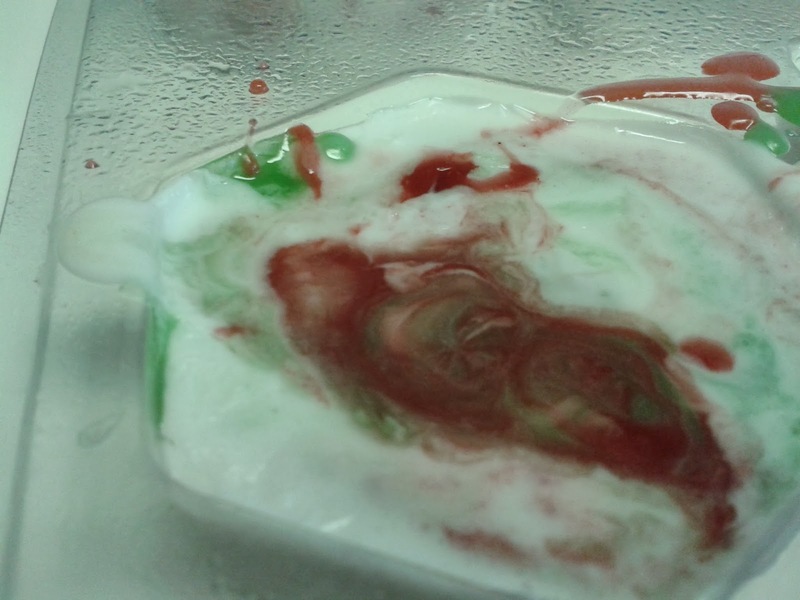 Place 1-2 drops red soap colorant in the first bowl, and 1-2 drops green soap colorant in the second bowl. Set these aside. 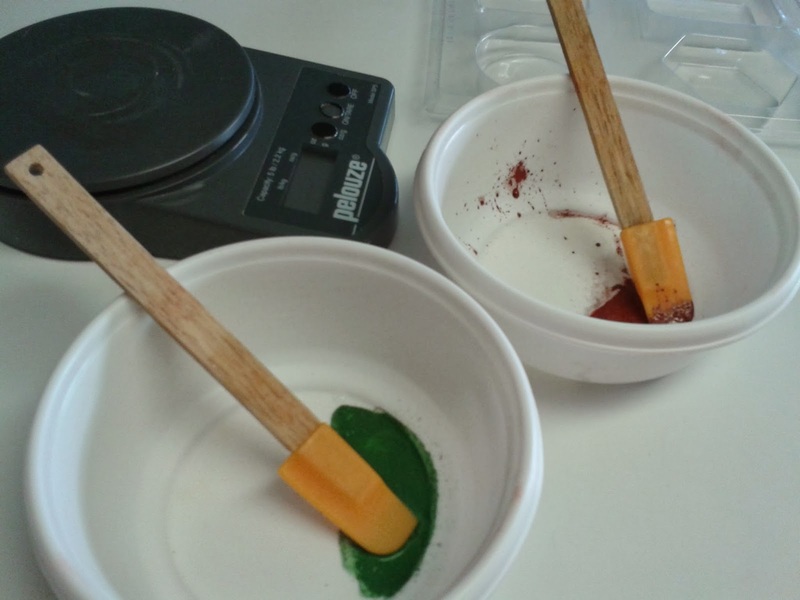 One to two drops of colorant is all you'll need -- they're concentrated. Step 5: Once the soap is completely melted, remove from heat. Add 3/4 teaspoon fragrance to the white base, and 3/4 teaspoon fragrance to the clear base. Stir in completely. 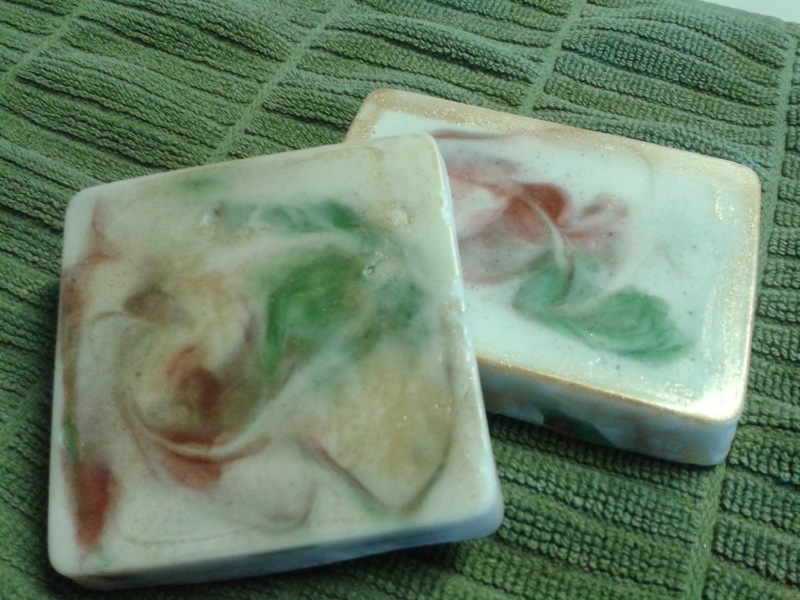 If your soap base has thickened too much, you can rewarm it gently until it's liquified again. Step 6: Here's where we want to work quickly, so that we can get our soap poured into the molds before it hardens! Divide the clear base about equally between the two bowls (red and green). I just eyeball the amount, it doesn't have to be perfect. Stir until the colors are mixed into the soap. Now, pour some of the red and green soap base into each soap mold. Again I just eyeball the amount. 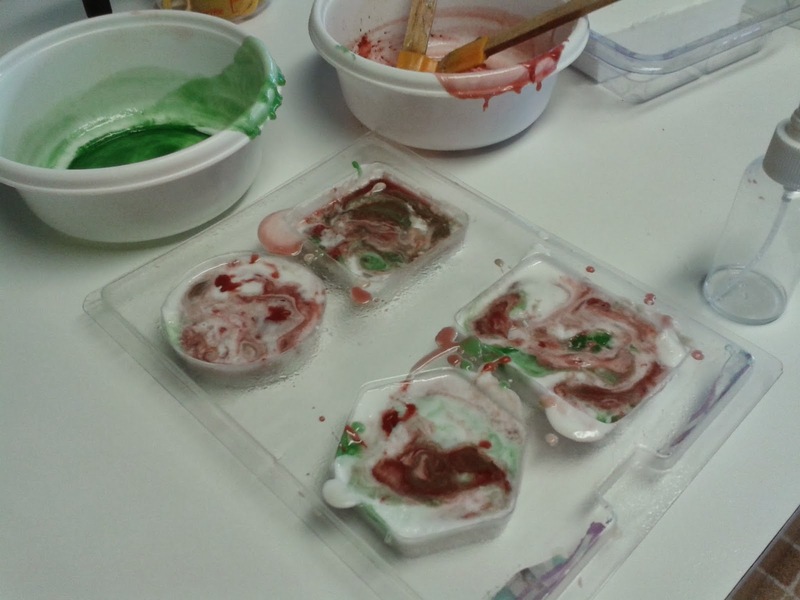 Use the white soap base to finish filling the molds. Take a spatula or spoon and swirl the colors in the mold. Try not to "over swirl." I usually just make a figure 8 in the mold and leave it at that. You don't want to over-swirl, or your colors may get muddied. I swirled this bar with a loopy figure 8 and it's done. The soap may not look all that great now, but remember, you're looking at what will be the bottom of the soap. The top will look lovely. If you're unsure how much swirling to do, go ahead and lift the mold up a bit and peak. Not happy with it? swirl some more. 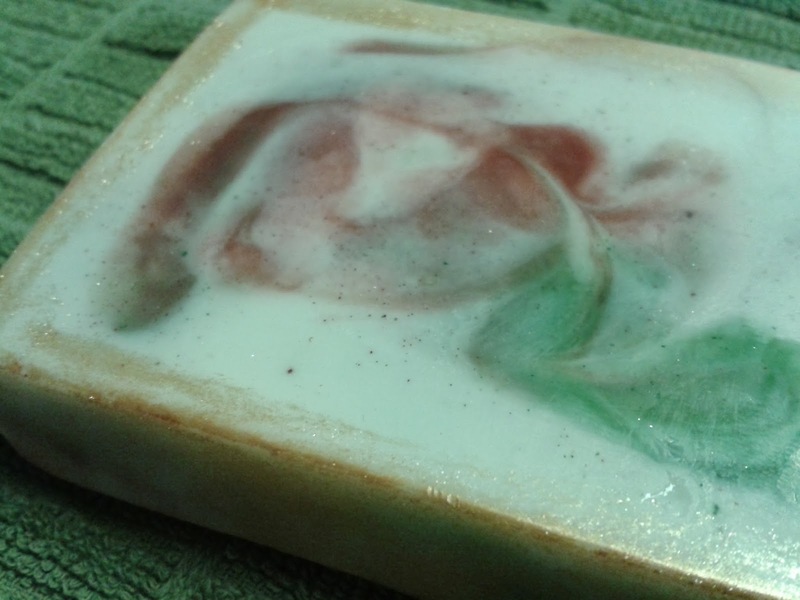 Just be sure to stop swirling before the soap starts to thicken. It may look a mess from this side, but remember, this is the bottom of your soap. Step 7: Spritz the top of the soap with alcohol. Let set undisturbed for several hours or overnight. Step 8: Once the soap is completely cooled and hardened, pop each bar from the mold. With the gold soap glitter and your finger, gently dust the surface of the bar to give it that extra Christmas sparkle! You can also just dust around the edges to give it that gilded look. Super pretty! Soap bars - pre-gold glitter. They're pretty enough to leave like this, if you'd like. Soap bars - after glitter. It adds a bit of sparkle. They remind me of marble tiles! I hope you've enjoyed this series! There's still plenty of time to make wonderful, handcrafted gifts for Christmas, so if you've missed any ideas, you'll find links to them below. And if you have any ideas for handmade gifts, share them with me!